In today's boneless skinless society, it is important to revisit a part of the animal that is often overlooked, and even more frequently thrown in the garbage. The skin. It is the potato chip of the animal world. Crisp, crackling, and satisfying. The skin may very well be the most delicious part of the beast. Whether it's pork, fish, or chicken, the skin of these animals has been widely regarded as unfit for consumption and given a nasty reputation as being unhealthy. The simple truth is that the skin is not where the fat and calories lie at all. That fat you dread is actually hidden beneath the skin. Skin itself is comprised of mostly proteins, which is why (when treated properly) it crisps so beautifully. Many home cooks and chefs alike shy from cooking the skin because if not cooked just right, it turns into a soggy chewy mess. It is important to remember exactly where the fat is located and even more important to keep in mind that fat prohibits crispness. It is absolutely key to render (or slowly melt) the fat behind the layer of skin before attempting to crisp it. -First: Season the meat well in advance with salt and any spices you chose to add. Allow to rest for several minutes, then dry with a paper towel any moisture that has escaped. Salt will draw water from the meat which will provide a better sear. -Second: Add a tablespoon of oil to a room temperature pan (non-stick or cast iron may be best for new cooks). Place the skin side down in the oil. -Third: Turn the heat to medium low and allow the fat to render from beneath the skin. Sometimes, applying a gentle steady pressure helps this process. Do it slowly and be patient. This step can take anywhere from 5 to 15 minutes. The rendered fat will begin to pool in the pan. Carefully pour it from the pan as you go. It's not a bad idea to save this liquid gold for other applications. -Fourth: Once a significant amount of fat has been rendered from the meat, turn the heat to medium and crisp the skin. Be careful, because the meat doesn't have that layer of fat protection any more, it will burn easily. This will take just a few minutes. -Five: Flip the meat, add a flavorful liquid (stock, beer, wine, whatever) and finish your meat in the over or on the stove top. Be careful to not get the added liquid on the skin lest you want to ruin its perfect crispness! It would be unfair to not mention that there is another way... One that takes a little more work and patience, but yields an amazing result. The skin can be removed entirely, and crisped separate from the meat. To do this, you must scrape every last gram of fat from the underside of the skin and bake it slowly at a very low temperature. I prepared my chicken skins (pictured above) at 300 degrees for 1 hour. 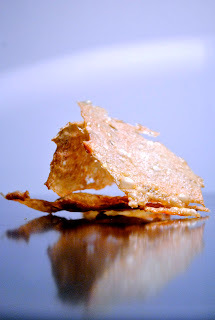 A quick anecdote: during my time at Noma, there was a snack on the menu that consisted of crisp chicken skin, rye bread, and a soft cheese with caviar folded into it - a sandwich of sorts. It was mind-blowing. A textural masterpiece. I loved to eat these things and remember breaking a few on purpose just so I could have a bite. Everyday a large case of chicken skins would arrive at Noma and it would be one of the Stagaire's tasks to take a chef's knife and scrape the fat from each and every skin. It would take them. All. Day. Long. Just imagine standing there for hours. Scraping. Chicken. Skin. They looked miserable. They were miserable. Every time I saw that case of chicken skins arrive I prayed that I wouldn't be the unlucky one chosen to scrape them that day. I got lucky. Incredibly enough, I managed to finish my time there without having to scrape a single skin. The other day, I chose to put my skin scraping skills to the test and prepared a dish that speaks to me both physically (it was a cold rainy day) and mentally: Chicken and Dumplings. It just so happens that this was the first real dish I had ever prepared for my family. Before the idea of becoming of chef had even entered my mind. The hearty dish brought back memories of meal times spent with my family and my days in the Noma kitchens. It was a strange juxtaposition of feelings. I ate. Happy, comforted, and satisfied. Surprisingly, even with all that other goodness going on, the skin was the star of the dish.